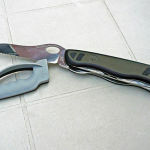 Whether you’re speaking about an expensive set of kitchen knives, your trusty pocket knife, or any other type of blade, the edge will eventually dull and the blade will need to be sharpened. This has always been a lot trickier than it seems. As countless people can attest, using cheap knife sharpeners or non-working sharpening systems can absolutely ruin a blade. They may heat and grind the metal without producing a new edge, or they may simply flatten the edge. This is because low-quality sharpeners do not actually address the real problem of dull blades. To understand the best knife sharpening system, one must first understand the simple science behind a blade’s edge and why it loses its sharpness. Have you ever heard people tell you not to cut on a metal cutting board, or not to attempt to chop through wood with your knife, and other little dos and don’ts regarding proper usage? Most of these are wives tales, and what actually dulls the blade isn’t necessarily that you’re attempting to cut hard surfaces but rather the fact that a blade’s edge bends. Think of a sharp knife and how it cuts; compare it to a razor blade or scalpel. You will understand that sharpness is thinness and straightness. A sharp blade has an incredibly thin, straight edge. Even the strongest metals out there (the most popular knife metal being stainless steel) is going to bend regardless of use. You cannot see this with the naked eye. Looking at a dull blade, it may still appear sharp. 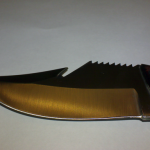 Though on a microscopic level, you would see many portions of the blade’s edge bent over like folded laundry. Cutting harder materials may speed this process, but a dull edge is an inevitability. This two-step process varies depending on the knife in question. Your kitchen knife, for example, may typically only require a few strokes on the honing rod or a quick run through a wheeled sharpener-honing hybrid. A hunting knife, throwing knife, pocket knife, and other types of blades may require a lot more maintenance when you sharpen them, including grinding the edge away and honing to a great finish. 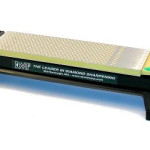 One thing you have to understand about a knife sharpening system is that it is completely different from a sharpening method. In other words, your research might point to a sharpening stone and a honing tool being the best method. And that would be correct, according to the science of a knife’s edge. Using a honing blade properly is how chefs keep their knives sharp, and even something as simple as a leather strap used for honing is how barbers keep their razors sharp. The stone in this type of method is used for lightly grinding away imperfections in the blade, or for completely re-edging the blade once honing no longer works. With a knife sharpening system, however, you are receiving an automated tool that simultaneously hones the blade while lightly grinding it. With the right system, you can sharpen your knife as good as new in a matter of seconds. You often see such systems attached to can openers or available at your local big-box retailer on sale, typically requiring a couple of AA batteries. These systems are ones you should avoid like the plague. They will kill your expensive blades and make them about as useful as a butter knife. Instead, think about investing in a complete multi-step system like the Chef’s Choice 130. The Chef’s Choice 130 3-Stage Knife Sharpener is one of the most highly-rated systems online. It works in three stages to give any knife a like-new, razor-sharp edge, and it works very quickly. To use the Chef’s Choice 130, you only need to place the knife’s edge into the slots on the machine, in the order that they’re listed. You will simply run your knife’s edge gently and slowly through the slots. In a matter of seconds, you move on to the next slot. When you’re finished, a dull, twisted, ugly knife comes out looking like a brand new blade. There are similar knife sharpening systems out there, but the Chef’s Choice 130 is a perennial crowd favorite.